Jean Walker (nee Pretswell) was born in 1925 and lived at number nine Cardigan Terrace from the age of about four until she got married. Her father Norman’s removal business operated from there for over 80 years and her uncle, Edmund Forbes Pretswell, ran the shop on Heaton Road that now bears his name again. 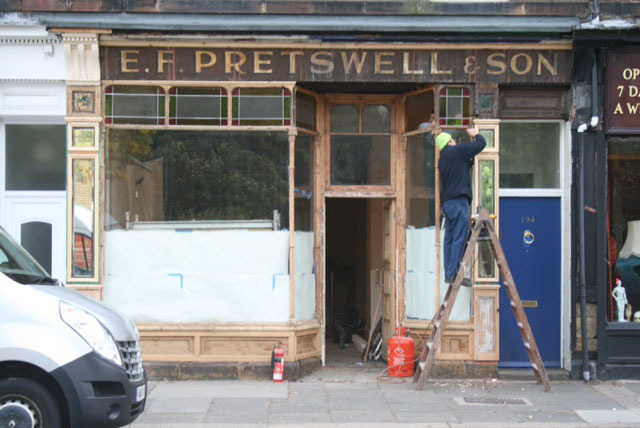 Pretswell’s signage being uncovered in 2013. Jean’s vivid memories of growing up on Cardigan Terrace have helped create a portrait of a Heaton street in the years preceding World War Two. But the story began some forty years before Jean’s birth. The street appeared for the first time in ‘Ward’s Directory’ of 1888. At that time, it comprised just 12 occupied houses between Heaton Park Road and Heaton Road, with just an ‘Infant’s Home’ (sic), with Mrs M Harvey the matron, on the other side of Heaton Road. The first residents of Cardigan Terrace included Edwin Bowman, an architect who built mainly in the villages around Gateshead, and J Sinclair jun, a ‘tobacconist’. 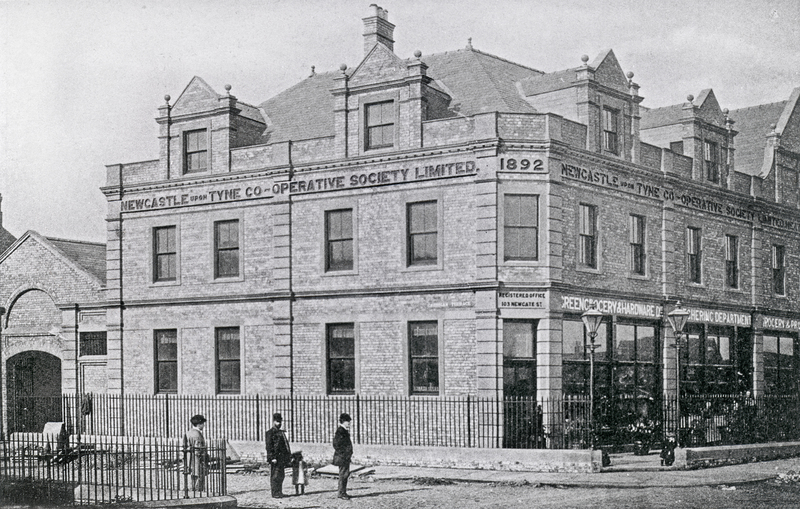 Could he have been a member of the Sinclair family who manufactured cigarettes in Newcastle? By 1900, the terrace had expanded to almost 150 houses, the occupations of its inhabitants reflecting a broad, though predominantly middle class, social mix as well as the local economy of the time. They included: J Piercy, a blacksmith; W H Robinson, a bookseller; D W Patterson, a surgeon; E Tait, a professor of music; S Lyne, a salvationist; R Jordan, a cart proprietor; J Lowrie, an egg merchant; W Murray, a butler; R Donaldson, a caulker; J Wallace, a ship chandler; and T Richardson, a miller. We searched online newspaper archives to see what else we could discover about Cardigan Terrace’s pre-war history. The first major news story we found dates from 1893 when the terrace became the focal point of a notorious bigamy case. William Breakwell, a commercial traveller from Birmingham, had married Catherine ‘Rachael’ Minto in 1886 but Breakwell later married another woman in Birmingham. He also threatened to kill his first wife’s father, Andrew Storm Minto, a retired ship’s captain, who lived in Cardigan Terrace. The case was reported extensively at the time and must have created quite a stir locally. Some twenty years later, a Cardigan Terrace boy, Alfred Adamson, was in the news. He and a friend were ‘examining a firearm in Heaton Park‘, when the weapon was accidentally fired, inflicting injuries on young Alfred and necessitating his ‘removal to the Infirmary‘. This was in the early months of World War One, when soldiers in training were billeted nearby. But not everyone was so lucky in those pre-NHS days. Later the same year, Joseph Metcalfe, aged 80, a retired school attendance officer, who lodged in Cardigan Terrace, was struck by a tramcar near Cheltenham Terrace. He was injured in the head and shoulder and merely ‘removed to his lodgings, where he died the same day’. At this time, number 27 was occupied by the White family. Alexander Henry White was a schoolmaster but, in the late 1880s and early 1890s, he’d been one of the city’s best known and respected footballers. 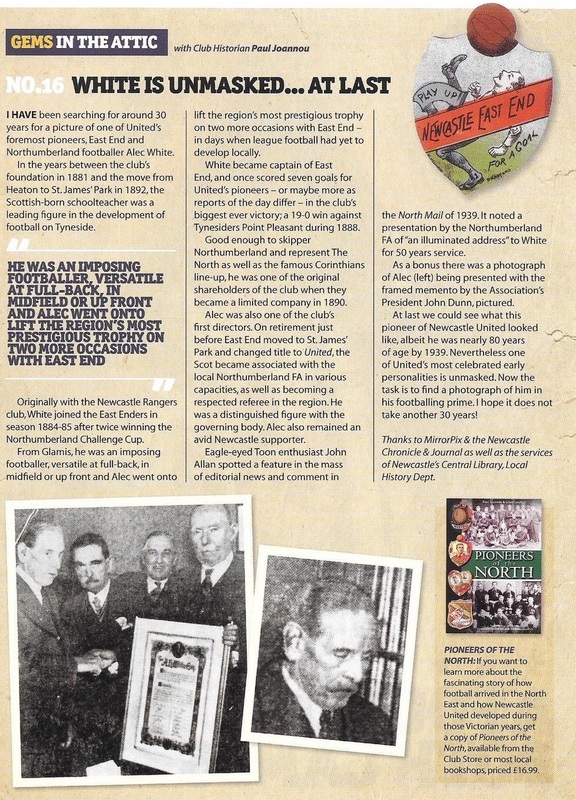 Alec White had played for and captained Newcastle East End, the Chillingham Road based club. On one occasion he had scored 7, or maybe 9, goals (reports differ) in a 19-0 victory. He also captained East End at cricket. 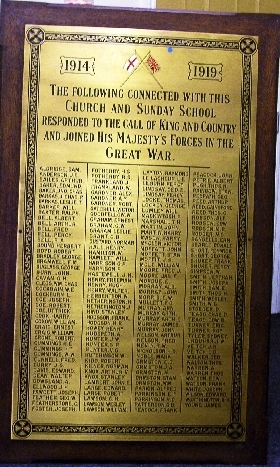 We found quite a lot of mentions of Cardigan Terrace in relation to World War One: in 1915, when the shortage of volunteers for the armed forces was becoming acute, there were reports of a number of outdoor recruitment meetings at the corner of Cardigan Terrace and Heaton Road (where St Cuthbert’s Church and Wild Trapeze are now). A few months later, we find a Mrs Dennison of 23 Cardigan Terrace and described as President of the National British Women’s Temperance Association (NBWTA), donating gifts of ‘slippers, towels and magazines’ to the Northumbrian Field Ambulance Hospital. We’ve seen before, in our research into Heaton’s Avenues, that civilian donations and voluntary work to help the war effort were commonplace. The people of Cardigan Terrace, like others in Heaton, wanted to do their bit. But inevitably there were casualties: on November 14 1916, Corporal Edwin Thirlwell Adamson, aged 19, of 44 Cardigan Terrace, Who served with the Northumberland Fusiliers, was killed in action in France. He was the older brother of Alfred who, two years earlier, had been injured while playing with a gun in the park. and its commemorative stained glass windows, still intact in the former Ark building, next to Southfields House on Heaton Road, and also on Heaton Harriers’ 1914-18 Shield, which is still competed for every Remembrance Sunday. Arthur was the Harriers’ Honorary Secretary. ‘We played in the street. There was no traffic, no buses on Cardigan Terrace back then. But mostly we played in the back lane. We called for people at the back door. At first, it was cobble stones. We played races and hide and seek… But then they concreted the lane so we could skate and ride bicycles as well. We played tennis. The concrete was in sections. We used the middle section as the net. ‘The lady at number seven, Miss Birkett, made hats and she also made little leather purses and put them in the window. She would dress the window up a little bit and have a hat stand with perhaps two hats on because she had made them by hand. Lots of people ran little businesses there then. ‘The lady at number five worked at Beavan’s and her husband was a house-husband – very unusual in those days. Opposite was Shepherd’s Commercial College. Mr Shepherd was a cripple in a chair. He taught shorthand and typing and Esperanto. I went to him to learn shorthand typing. This was in the late 30s and early 40s. Henner Hudspeth must have been Henry, the younger brother of Arthur, who had died in World War One. Young Jean probably wouldn’t have known about Arthur. But his memory lives on. Henry and Arthur Hudspeth, Miss Birkett, Bobby the fish boy, Alfred and Edwin Thirwell Adamson, Captain and Rachael Minto, Joseph Metcalfe, Mrs Dennison, Mr Tweedie, Mr Shepherd, the Pretswells, Alec White and the other residents of Cardigan Terrace are part of the rich history of Heaton. Thank you to Jean for helping us bring them back to life. 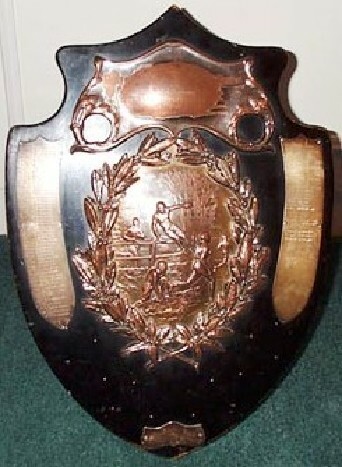 This entry was posted in Research and tagged Alec White, Alfred Adamson, architect, Arthur Hudspeth, Captain Andrew Storm Minto, Cardigan Terrace, Chillingham Road, cricket, Cuthbert Bainbridge Memorial Methodist Church, Edmund Forbes Pretswell, Edwin Bowman, Edwin Thirlwell Adamson, El Dorado ice cream, football, Heaton Harriers, Heaton Park, Heaton Park Road, Heaton Road, Henry Hudspeth, Jack Common, Jean Walker, Joseph Metcalfe, milliner, Miss Birkett, Mrs Dennison, Newcastle East End, Norman Pretswell, Rachael Minto, Shepherd's Commercial College, Shields Road, St Cuthbert's Church, Stainthorpe's Dairy, war memorial, WW1, WW2 on March 8, 2015 by oldheaton. I remember the El Dorado ice cream man coming around the streets. Way back in the late 30s I lived in Cardigan Terrace before moving to Stannington Avenue in 1938 (at age 3 yrs) until 1959. I don’t remember too many people from Cardigan Terrace but do remember many from Stannington Avenue. Reading about Alec White, the house around the corner from Cardigan Terrace on Heaton Hall Road (to the south) in the 40s was occupied by a Mr and Mrs White (any relation? ), but she ran a studio out of that house teaching children to dance (one of which was me!) and also a concert party featuring dancers and comedians who visited schools and hospitals during the war. It was called “Miss Mewton’s Merry Moments” Mewton was her maiden name. Hi Muriel, Jean did mention dance schools during her interview. Will have another listen to the tapes to remind myself of what she said (We’ll be featuring more of her reminiscences in future articles). Mr Shepherd who ran the Commercial School was my uncle George. The family lived in Cardigan Terrace and my Dad was the youngest of 9. The school later moved to 218 Heaton Road where George lived until he died. He was the eldest and was born with infantile paralysis, which we now call Polio and yet could write copperplate, spoke Esperanto on Sundays with the whole family; travelled to Easter Europe to play chess, taught book-keeping and Pitman’s Shorthand, while his wife to be, Dorothy Haig, previously widowed, taught typing upstairs. The Shepherd family on Cardigan Terrace: either William, my Grandpa who later lived in Leyburn Drive, High Heaton with his daughters, Molly and Beth, possible started the Pandon Mission, a clock with a plaque presented to him in thanks was found in my parents home recently. We think it was founded to get people to ‘sign the pledge’ against the ‘demon drink’. I remember my aunts only ever drinking Ginger Wine at Christmas! I am recovering from an op and will hopefully ‘get my brain in gear’ soon! Thank you so much for adding to our story of Cardigan Terrace. It’s great to find out more about George. We’ll make sure Jean reads your comment. Once you’re feeling up to it, we could maybe do a feature on George, the school and/or other members of your family? We’re finding lots about various temperance movements as we research Heaton, some of which Michael wrote up in this article on the Lumleys of Sixth Avenue. And personally, I’m fascinated by the Esperanto. I had a great uncle who was a speaker and enthusiast, believing there would be fewer wars if we all spoke a common language. Our grandfather Robert Whitehouse, wife Mary Whitehouse and daughter Edna lived at number 85 Cardigan Terrace, I’m not sure of the year that they moved there but I do know that it was early in my Mothers life who was born in 1919. Grandad was a Stonemason and had his own business. Mum passed away last year in Stockton on Tees and my grandmother lived in Cardigan Terrace until her death in 1985. We used to visit her there and I still have fond memories of Cardigan Terrace. I don’t know this area well, but the “Stainthorpe”, dairyman, mentioned here, is a relative of mine (my great, great, great uncle) :– John George Stainthorp, who was born in Yorkshire in 1887 and who moved to Newcastle at about four years old with his father Charles, who was also a dairyman and butcher. He lived first at 56 Addison Road, and later at 97 Cartington Terrace. I believe he ran his dairy from the Chillingham Road area, at least in the early years. He died in 1959; I know his son J. G. Stainthorp junior carried on the dairy business, but I don’t know for how long. I came across the will of my 2x great grandfather Matthew LAMB also known as Matthew Hudspeth from June 1911. One of the executors was William Hudspeth from 40 Cardigan Terrace. William was the chief sanitary inspector . Matthew lived at High Pitt Farm and his “father” James Hudspeth at Major Farm Byker.